Pocket size 30ml pump action SPF30 sunscreen which features a unique twist safety lock to prevent accidental discharging. Ingredient information is printed on one side of the container with plenty of space for branding on the other. It complies with the AS/NZS 2604:2012 sunscreen standard. This item is not available in Australia. Colours: White. Dimension: Dia 29mm x 107mm. Print Description: 50mm x 15mm. Print Type: Pad Print. Packing: Loose packed. 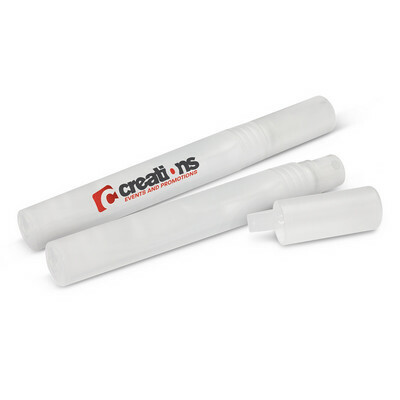 Handy pocket size pump action stick which contains 10mls of SPF30 sunscreen. Ingredient information is printed on one side of the stick with plenty of room for branding on the other. It complies with the AS/NZS 2604:2012 sunscreen standard. This item is not available in Australia. Colours: White. Dimension: Dia 16mm x L 140mm x 22mm (includes clip). Print Description: 55mm x 10mm. Print Type: Pad Print. Packing: Loose packed. 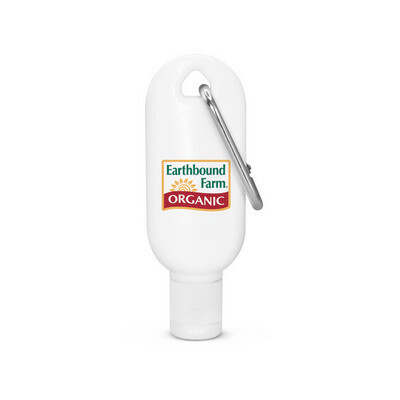 SPF30 Sunscreen with a moisturiser in a convenient tube with a no mess flip cap and a carabiner clip. Full ingredient information printed on the back of the tube. It complies with the AS/NZS 2604:2012 sunscreen standard. This item is not available in Australia. Colours: White. Dimension: W 35mm x H 101mm x 24mm. Print Description: 40mm x 23mm. Print Type: Pad Print. Packing: Loose packed. 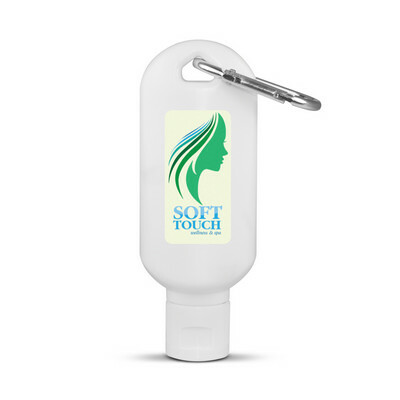 5ml pump action hand sanitiser which is easily attached to a key ring so it is always at hand when needed. 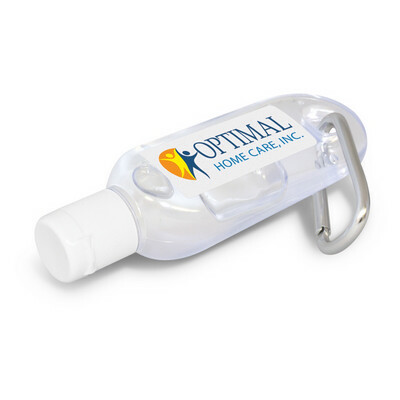 Kills 99% of bacteria and germs instantly and has full ingredient specifications on the tube with plenty of room for branding. Colours: Frosted Clear/Black. Dimension: Dia 14mm x 86mm (Dia 16mm ring). Print Description: 40mm x 8mm. Print Type: Pad Print. Packing: Loose packed. 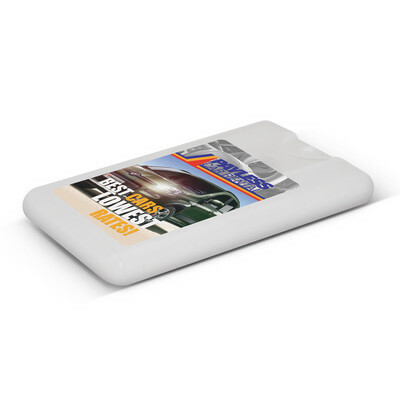 Unique credit card shaped 20ml pump action hand sanitiser which features a large branding area. Full ingredient specifications are printed on the back of the card. Colours: Clear. Dimension: W 56mm x L 86mm x 11mm. Print Description: 60mm x 40mm. Print Type: Pad Print. Packing: Loose packed. SPF30 sunscreen with a moisturiser in a convenient 15ml tube with a screw on cap. Full ingredient information is printed on the back of the tube. It complies with the AS/NZS 2604:2012 sunscreen standard. This item is not available in Australia. Colours: White. Dimension: W 38mm x H 71mm x 24mm. Print Description: 25mm x 15mm. Print Type: Pad Print. Packing: Loose packed. Pleasantly flavoured frosted lip balm with SPF 10 sunscreen included. Colours: Frosted White, Frosted Yellow, Frosted Orange, Frosted Pink, Frosted Red, Frosted Bright Green, Frosted Light Blue, Frosted Dark Blue, Frosted Indigo, Frosted Black. Dimension: Dia 19mm x H 70mm. Print Description: 42mm x 10mm. Print Type: Pad Print. Packing: Loose packed. Pleasantly flavoured twist action lip balm with a SPF10 sunscreen and a convenient lanyard. Colours: White, Frosted Yellow, Frosted Red, Frosted Green, Frosted Blue, Black. Dimension: Dia 19mm x 80mm (lanyard 860mm approx). Print Description: 42mm x 10mm. Print Type: Pad Print. Packing: Loose packed. 20mls of SPF30 sunscreen in a unique credit card shaped container. Ingredient information is printed on the back and it has a convenient pump action. It complies with the AS/NZS 2604:2012 sunscreen standard. This item is not available in Australia. Colours: White. Dimension: H 86mm x W 55mm x 10mm. Print Description: 60mm x 40mm. Print Type: Pad Print. Packing: Loose packed. 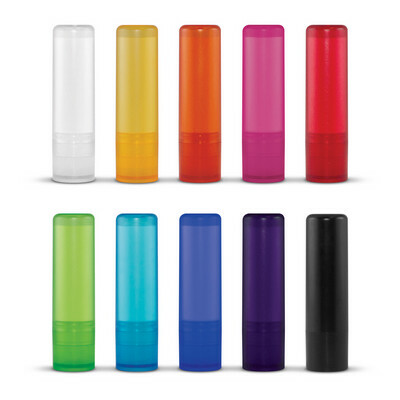 SPF 12+ vanilla scented lip balm in frosted coloured casing. Size: 70 x 18mm dia Colour: Orange. Decoration Option: Pad Print. Decoration Area: 45 x 9mm. Small 15ml bottle of SPF30 sunscreen with a rubber strap for attaching it to bags etc. Ingredient information is printed on the back of the bottle and it has a no mess flip cap for easy dispensing. It complies with the AS/NZS 2604:2012 sunscreen standard. This item is not available in Australia. Colours: White bottle with Black holder. Dimension: W 36mm x H 68mm x 23mm (excludes handle). Print Description: 25mm x 15mm. Print Type: Pad Print. Packing: Loose packed. The ultimate sun protection in a 10 gram compact. Zinc is ideal for sensitive parts of the body and is traditionally used on the nose, face and ears. Contains zinc oxide which is a naturally occurring mineral that works by forming a barrier on the skin to diffuse the sun. It complies with the AS/NZS 2604:2012 sunscreen standard. This item is not available in Australia. Colours: Clear. Dimension: Dia 50mm x H 20mm. Print Description: 40mm circle. Print Type: Pad Print. Packing: Loose packed. Lip balm in a handy twist action stick. It contains zinc oxide which is a naturally occurring, non toxic mineral that provides a high level of sun protection by forming a barrier on the skin. Colours: White, Fluorescent Yellow, Fluorescent Pink, Fluorescent Green, Fluorescent Blue. Dimension: Dia 19mm x H 70mm. Print Description: 42mm x 10mm. Print Type: Pad Print. Packing: Loose packed. SPF30 sunscreen with a moisturiser in a convenient 30ml tube with a no mess flip cap. Full ingredient information is printed on the back of the tube. It complies with the AS/NZS 2604:2012 sunscreen standard. This item is not available in Australia. Colours: White. Dimension: W 46mm x H 98mm x 29mm. Print Description: 30mm x 20mm. Print Type: Pad Print. Packing: Loose packed. 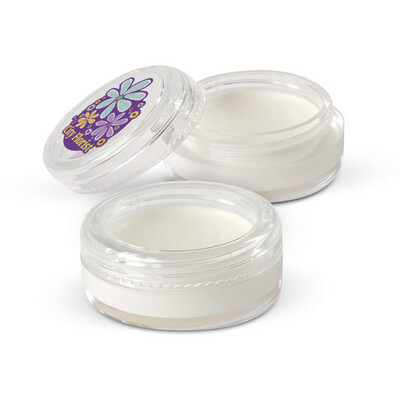 SPF 12+ vanilla scented lip balm in frosted coloured casing. Size: 70 x 18mm dia Colour: Red. Decoration Option: Pad Print. Decoration Area: 45 x 9mm. 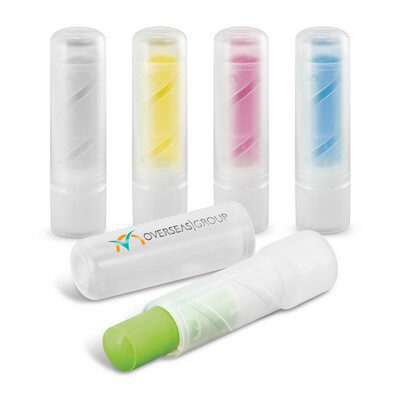 SPF 12+ vanilla scented lip balm in frosted coloured casing. Size: 70 x 18mm dia Colour: Green. Decoration Option: Pad Print. Decoration Area: 45 x 9mm. A handy combination lip balm which features a conventional twist action SPF10 lip balm and a smooth SPF30 roll on lip balm in one convenient tube. It is supplied in a printed box which has full ingredient information included. Colours: White. Dimension: Dia 19mm x L 90mm. Print Description: 42mm x 10mm. Print Type: Pad Print. Packing: Individual boxes. 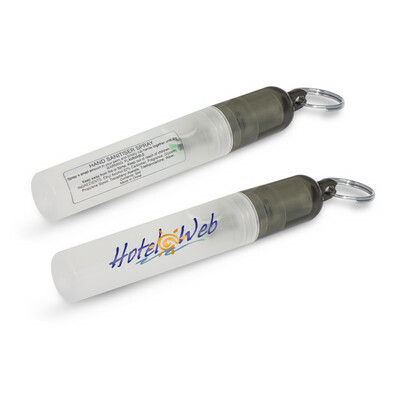 15ml pump action pocket sized sanitiser that kills 99% of all bacteria and germs. Comes with full ingredient specifications printed on one side and plenty of room for branding. Colours: Clear. Dimension: Dia 16mm x L 136mm x 22mm (including clip). Print Description: 55mm x 10mm. Print Type: Pad Print. Packing: Loose packed. 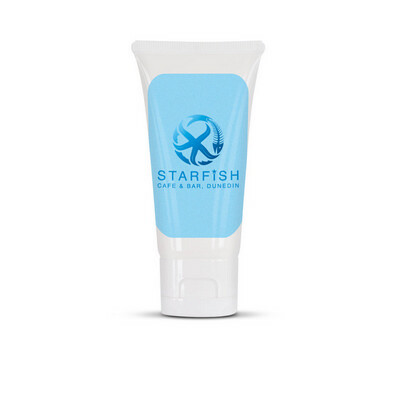 SPF30 sunscreen with a moisturiser in a convenient 50ml tube with a no mess flip cap. Full ingredient information is printed on the back of the tube and it complies with the AS/NZS 2604:2012 sunscreen standard. This item is not available in Australia. Colours: White. Dimension: W 54mm x H 117mm x 34mm. Print Description: 40mm x 25mm or 50mm x 20mm. Print Type: Pad Print. Packing: Loose packed. SPF30 Sunscreen with a moisturiser in a convenient tube with a no mess flip cap and a carabiner clip. Full ingredient information printed on the back of the tube. It complies with the AS/NZS 2604:2012 sunscreen standard. This item is not available in Australia. Colours: White. Dimension: W 42mm x H 114mm x 30mm. Print Description: 30mm x 50mm. Print Type: Pad Print. Packing: Loose packed.